The Stage Setter 24 is a conventional dimming console that includes 24 total DMX channels. Try your hand at 5 built-in program chases or 10 programmable, password-protected chases that can contain up to 64 steps per pattern. The console operates in three modes (2 x 12, 12 x 12, and 1 x 24) and its backup memory protects your information after a power loss. 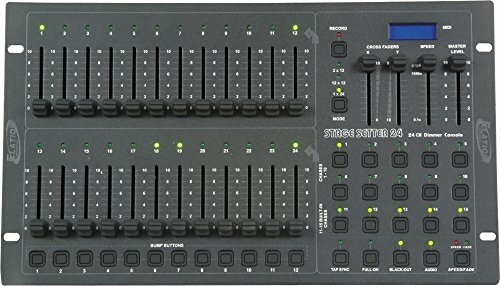 The Stage Setter 24 is a stage lighting controller and conventional dimming console that includes 24 total DMX channels. Try your hand at 5 built-in program chases or 10 programmable, password-protected chases that can contain up to 64 steps per pattern and have separate speed & fade controls for chase playback. The console operates in three modes (2 x 12, 12 x 12, and 1 x 24) and its backup memory protects your information after a power loss. It features 12 scene master fader playbacks, 12 bump master playbacks, a tap sync operation speed that goes from 0.1 seconds to 10 minutes, plus it's MIDI compatible.